It was only around two centuries ago that the authorities reluctantly started to accept the need to take some responsibility for housing the wives and children of soldiers. Before then, families were required to fend for themselves, which was fine if your husband or father was an officer of independent means, in which case you would take lodgings appropriate to your social status. 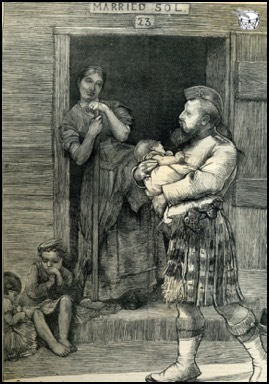 Near-penniless non-commissioned officers' families who were determined to accompany their serving soldier had little option but to camp out in the open or squeeze into a basic billet when on the move with the army, or else to rent a squalid space near the barracks. A new phase of barrack-building from 1793 resulted in a chosen few wives and families being allowed to live in a curtained-off corner of a barrack hut or room, which was not a satisfactory situation for anyone, as Lieutenant Colonel A H Trevor, reported: '. . . these wretched creatures [soldiers' wives] are allowed to crowd into Barracks, with their starving children - some with families of 5, 6, 7 & 8 (I have this last number in the depot) taking up the room, bedding, tables, fires of the men - destroying their comfort, and all attempts at cleanliness - making the Soldiers discontented & driving them to the Canteen or Beer Shop and frequently to Desertion' (The Naval and Military Gazette, April 1843). 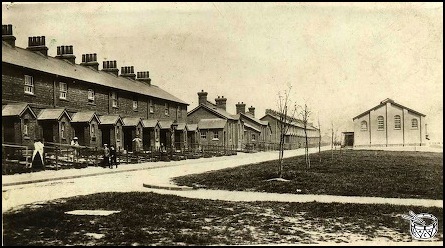 The situation eventually improved during the latter half of the nineteenth century, with the gradual implementation of a programme of construction of separate married quarters within barracks, ranging from a room or two (sometimes shared with other families) through huts and flats to modest houses. Luxurious these married quarters weren't, nor is service family accommodation (SFA) today, but at least they gave families some privacy. Married quarters at Tidworth, Wiltshire, in the days when army wives wore long skirts and their sons, flat caps. When a regiment was posted abroad, its dependents were generally accommodated apart from the local populace, on-the-strength families in India before World War II being housed in military cantonments, with those stationed closer to home after the war (in Cyprus or Germany, for example) usually living either 'within the wire' (within the bounds of a military base) or in specially constructed 'patches' (housing estates) of married quarters. The army sometimes rents flats or houses from locals for its families, and there has recently been an increasing trend for army children in Britain to live in homes that their parents have bought, rather than rented from the army at a subsidised rate, be it as an investment or as a home base in which the family can put down roots. 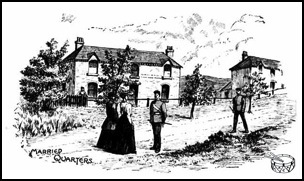 A soldier and his family are depicted at the door of their married-quarter hut (Number 23) in Aldershot, Hampshire, in a print that was first published on Saturday, 16 September 1871 in The Graphic, a weekly illustrated newspaper. 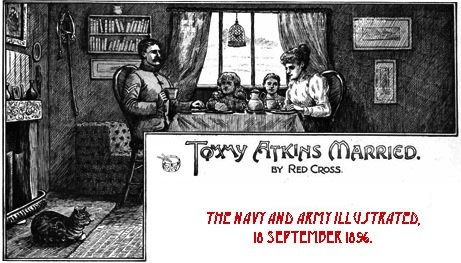 Taken from "Tommy Atkins" Married – Past and Present, a print comprising nineteen scenes that was originally published in The Graphic on 12 January 1884 (click here to see it), the images reproduced below illustrate three types of nineteenth-century service family accommodation. 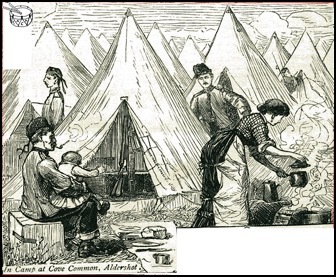 The first shows that tents were once the order of the day when in camp at Cove Common, Aldershot, with two further details from the print contrasting the crowded barrack-room accommodation that was originally allocated to married solders and their wives and children with the more private married quarters that were increasingly being provided towards the end of the nineteenth century. Left: 'In Camp at Cove Common, Aldershot'. 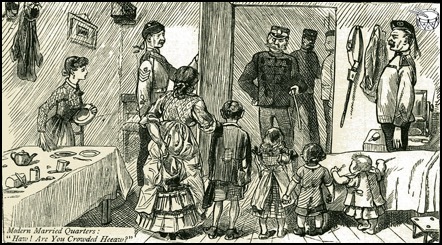 Below: 'A Soldier and His Family in a Corner of a Barrack-Room in the Old Days'. Below: 'Modern Married Quarters: "Haw! Are You Crowded Heeaw?"'. 'The improvements in the soldier's condition have been, though slow, sure, and the same may, perhaps even in a greater degree, be said of those of the soldier's wife. The present writer well recollects when it was nothing unusual for several families to be bundled into a large barrack-room, which they had to screen off as best they could, and wonderfully ingenious, albeit saddening, were the devices to which they were driven in their endeavours to maintain decent privacy. But the march of improvement has of late years made giant strides in the amelioration of the condition of the married soldier and his family. First, as regards his quarters, Tommy Atkins the Benedict, would be hard to please if he were dissatisfied with those now placed at his disposal. They are usually built in blocks, close to but distinct from the barracks occupied by the single men. They are bright and airy, well ventilated, gas and water laid on. In almost every case a family, even without children, are given a two-room quarter, the number of rooms being increased in proportion to the number of children: thus, where there are five children, the regulation provides for four rooms and a scullery. The kitchen is fitted with a cooking range, small but thoroughly effective, and which delights the heart of every housewife, an abundance of shelves and cupboards. I may here say that every living room must have a cubic space of 1800 feet. Government provides all absolutely necessary articles of furniture, with beds and bedding, but nothing is provided in the way of adornment, and it is simply astonishing how home-like and comfortable a soldier's wife manages to make her surroundings. When it is considered that regiments seldom remain more than one or two years at a station, and that two or three hundredweight represents the quantity of baggage allowed to be taken, it may easily be conceived that it would be injudicious to spend money, even if it could be afforded on furniture which it would be impossible to carry about. 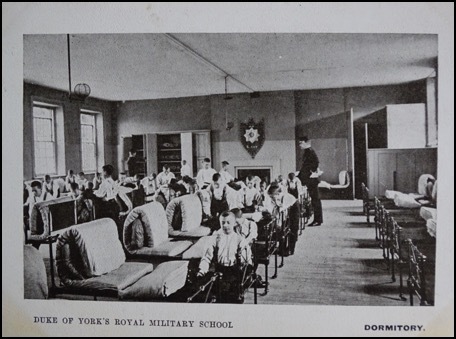 TACA is indebted to Barbara Rayner (née Messenger) for contributing the postcard below, which, as stated, shows a boy’s dormitory at the Duke of York’s Royal Military School. An army child herself, who married another, Barbara notes of the Duke of York’s Royal Military School, ‘My two brothers, a nephew and my son all went there, although it wasn't like that when they were there!’ Art Cockerill, who was educated at the Duke of York’s Royal Military School, and whose website includes a fascinating section devoted to the school’s history, informs us that the photograph shows a dormitory in the original Royal Military Asylum (RMA) building in Chelsea, not in the school’s newer – current – premises in Dover, Kent, which opened in 1909. Click here for further real photographic postcards of the school in Chelsea published by Gale & Polden as the ‘Wellington Series’. 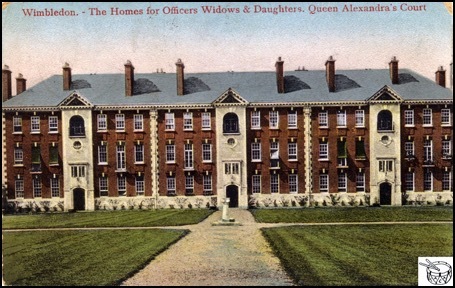 As the legend tells us, the building pictured on the postcard below is Queen Alexandra’s Court, ‘The Homes for Officers [sic] Widows & Daughters’ in Wimbledon. When this postcard was mailed, Wimbledon was part of the county of Surrey; today, it is in southwest London. The photograph below, which was printed in a July 1905 issue of The Sphere newspaper, presents a more panoramic view of ‘Queen Alexandra’s Court at Wimbledon for widows of officers of the navy and army’. Beneath the picture’s title is the line ‘Built at a cost of £60,000, to which the Queen, who opened the buildings on Saturday, contributed £3,000’. Today, it is further stated, ‘residents are all widows, former wives or single daughters of Officers or Warrant Officers of the Royal Navy, Army and Royal Air Force and . . . women who are retired Officers or Warrant Officers of those services’. To read Sir James Gildea’s History of the Royal Homes for Officers’ Widows and Daughters (Queen Alexandra Court) Wimbledon, from 1899 to 1918 (1918) online, click here. For more information and images of Queen Alexandra’s Court today, visit the Royal Homes’ website: http://www.theroyalhomeswimbledon.org. ‘My grandfather, John Lewis Platt, served in the 54th Royal Field Artillery during World War I, and died of his wounds in 1915. He was married to Tomima Jane, and she and their daughter, Alice, were living in Bordon, Hampshire, in 1916. If you think that you can help Maureen, she can be contacted by e-mail: ianandmaureen.flack@btinternet.com. 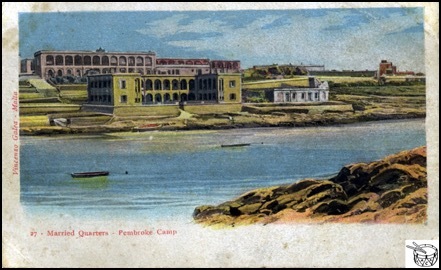 According to its caption, this undated postcard, published by Vincenzo Galea, presents a view of the married quarters at Pembroke Camp, Malta. Pembroke Garrison, as it later became, was ceded to Malta by Britain in 1977. 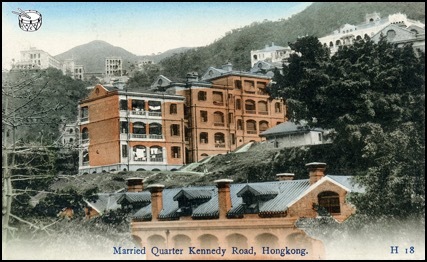 The old postcard reproduced below, labelled 'Married Quarter, Kennedy Road, Hongkong', illustrates the type of accommodation provided for British army families in the Mid-levels area of Hong Kong Island during the first half of the twentieth century. 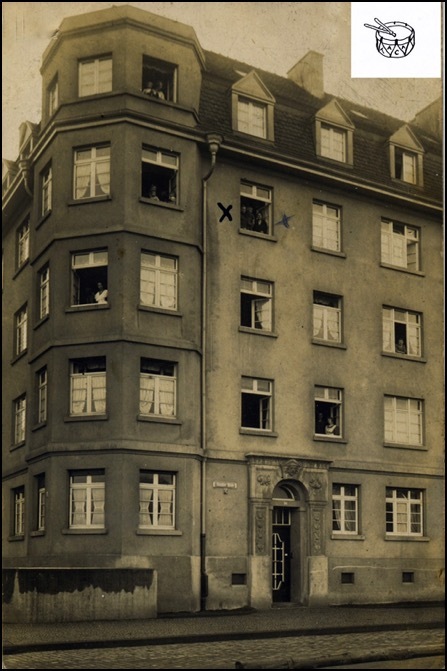 The black-and-white photograph below shows a corner of a block of flats, with some of the inhabitants standing at open windows. The photograph was printed on a postcard mount and there is a note written on the back that reads ‘Married quarters / R. Signals / B.A.O.R.’. 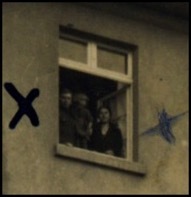 The pair of crosses flanking an upper window identifies the married quarters allocated to a Royal Signals’ family, and the man, woman and child seen at the window (right) are no doubt they. It is difficult to tell whether this image dates from the time of first British Army of the Rhine (BAOR), which existed in Germany from 1919 to 1929, or the second, from 1945 to 1994. The street sign by the entrance is sadly illegible, but appears to be in the Gothic script once common to German signage. 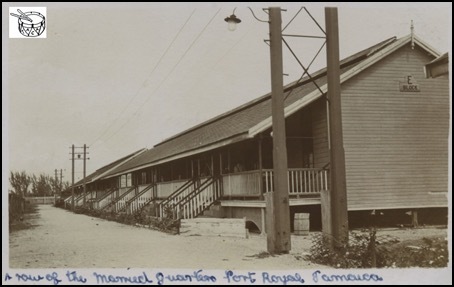 The old black-and-white postcard reproduced below, of unknown date, shows, as the sender has noted, ‘a row of the married quarters, Port Royal, Jamaica’ (and, specifically, ‘E block’). On the back, in the same hand – presumably that of a soldier writing to his wife, who hasn’t yet joined him in Jamaica – is written: ‘We shall have one of these when you come out’. 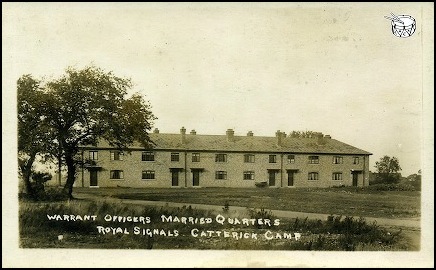 The postcard below is captioned 'Warrant officers' married quarters, Royal Signals, Catterick Camp'. The Royal Corps of Signals was based at Catterick, in North Yorkshire, between 1925 and 1994, so plenty of children whose fathers served in it will have lived in these six quarters. To read the memories of an army child who was born in Catterick Camp (later Catterick Garrison) in 1929 and who spent his early years there, see 'PERSONAL STORY: EXPERIENCING TERROR AND THRILLS AT CATTERICK CAMP AND WAR'S OUTBREAK AT ALDERSHOT'. ‘In 1939, my grandparents lived at 683 Nuns' Walk (now part of Sidbury Circular Road) and my parents lived at 601 Nepaul Road – both in north Tidworth. I have discovered that the 683 and 601 refer to War Department housing numbering on Salisbury Plain – i.e., 683 Salisbury Plain and 601 Salisbury Plain. If you think that you can help Malcolm, please contact TACA and we’ll pass on your message. Chris Fussell was living with his family in Moascar, Egypt, on, as Chris describes it, 'the terrible day Dad came home drunk from the sergeants' mess to our married quarter'. Read on to find out what happened, and for more about Chris' life as an army child, see the 'MEMORIES & MISCELLANEA' page ('PERSONAL STORY: WARTIME IN THE UK; PEACETIME IN MALTA, EGYPT AND OXFORDSHIRE', 'PERSONAL STORY: EXPERT FIRST AID IN MALTA' and 'PERSONAL STORY: MAYHEM IN A MALTESE MARRIED QUARTER'), the 'LIVES & TIMES' page ('PERSONAL STORY: 'EVER HEARD A SHOT FIRED IN ANGER?'' and 'PERSONAL STORY: BULLFROGS, CICADAS AND MACHINE-GUN FIRE IN EGYPT, 1951'), and the 'SCHOOLING' page ('PERSONAL STORY: MY EDUCATION AS A MARRIED-QUARTERS' CHILD'). 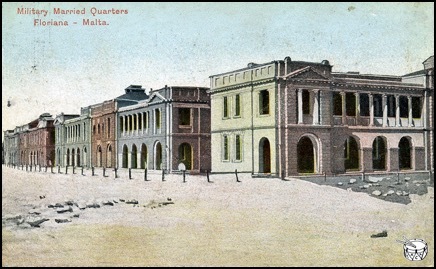 'We were living in a spacious, shady, comfortable, brick-built, deep-verandahed married quarter in the large Egyptian Canal Zone British garrison of Moascar, next to the sizeable Suez Canal town of Ismailia, about halfway down between Port Said and Suez, i.e., to the south, on Lake Timsah (said, by some, to be near the site of Moses' crossing, when the Israelites were fleeing Egypt and the pharaoh's chariots were in hot pursuit). Dad had been medically downgraded as a war-injured traumatic epileptic by 1951, but was still soldiering on in the Royal Pioneer Corps (not "his" beloved parent regiment, the Royal Warwicks) in the post-World War II army to get back his staff sergeant's "crown", as well as a better pension and maybe a better post-war life for our family. He was on phenobarbitone tablets and not really supposed to drink alcohol at all. Occasionally, though, he put a shot of rum in his early morning tea. Even our mum, a very strict lady, winked at this, saying, "He needs a bit of a boost", and "Shut up, you kids, give your dad a bit of respect!" On that terrible day, first Dad arrived home very late for Saturday lunch – it was a bit overcooked by then. He smelt of beer and seemed sleepy. Mum cried, and then shouted at him. (Strong stuff for a twelve-year-old boy to witness? I loved them both! I think my sister was out at work at the time – lucky her.) Meanwhile, a neighbour, the wife of a bombardier in the Royal Artillery, was physically setting about her "old man" for coming in drunk – and noisily. You couldn't help but overhear them all: it was hot, so everyone was out on their loofah-plant, creeper-screened verandahs to try to keep cool, and anyway, all of the doors and windows were open in that midday heat. Dad fell over, seemed to go to sleep, was a bit sick and started snoring. Mum positioned him carefully on his side, fished out his tongue (this was very important, she told me) and went to get another neighbour, a nice sergeant in the Royal Army Medical Corps, from the nearby military hospital. (Mum and his wife were good friends.) He checked out Mum's first aid on Dad approvingly, slid a thin blanket between him and the cool floor tiles, put a basin by his head and said, "No need to worry and no need to report it – if he has not slept it off in four to six hours, go for the medical officer. We will take your Chris here to the swimming pool, and you send for me before you summon the doctor – the pool is not far. OK, Missus?" 'The cases stood waiting. The military travel warrants were all in order. We were once more to set sail from England. On arriving at the Hook of Holland, we boarded a train and commenced a day-long rail journey across Holland into Germany, to arrive rather late at night at a place called Soltau. Road transport was on hand to take us the last few miles to our new home. Our final destination: an army garrison called Hohne (pronounced "Hoenuh"). I've lived in many places, but very few of them have had the impact upon me, or impressed me, as much as Hohne did. Our new address was Flat 6, Block L7. The married families were accommodated in one area of the camp in two-storey blocks containing six flats in each, three to each floor. Each block was within its own landscaped area of grounds, which was surrounded by a chain-link fence, the ground area being larger than a football pitch. Most had a sandpit as a standard extra. Immediately surrounding the building was an area of lawn. This eventually gave way to the remaining area (about half), which consisted of naturalised heather (a fruitful hunting ground for lizards) and woodland, mostly silver birches and the occasional fir tree. This was, after all, the North German plain, part of Lüneberg Heath [Lüneberger Heide]. Our flat was situated on the top floor, and took up most of the rear of the building. There were also cellars. In ours were stored our bicycles, sledges and garden tools. Later on, it doubled as a shooting gallery for us, where we would practise for hours with our "Diana" air rifles. The flat itself was not only roomy and spacious, but had central heating! Yes, radiators in each room and hot water twenty-four hours a day. Also double-glazing. Ours consisted of two sets of windows, about 4 inches apart. One set opened outwards and one set opened inwards. To crown it all, we also had a maid! Yes, we really had a maid. Throughout the remainder of our lives, the Friend family would never again live better than we did for the decade that we were to spend in Germany. I believe that at this time father was still a sergeant, but he couldn't have held that rank for too long as I only ever remember him as a battery sergeant major. He was an old hand of the British Army in India, so he was no stranger to having servants – char wallah, dobi wallah, boot boy etc – but for my mother, having a maid must have been something that she could never have visualised, even in her wildest dreams. At this time, 1951, Germany was in a terrible state, and for the ordinary people, these were very hard times indeed. Being a British Army sergeant, father's weekly wage was not very high. Our maid must have come very cheap to have enabled us to be in a position to afford to hire her services. So for us all a new era dawned. Everything in the flat, from the largest piece of furniture down to the smallest kitchen utensil, was army issue. There were no heating or electricity bills to pay either. What a simple way to live! The families' rations came around on time every week in the ration truck. A large, wooden box was hauled into the kitchen and placed on the floor. It contained all we required for the week, including the Sunday joint. I used to have a special place in my heart for those fat, army sausages. Now, what of the flat itself? At the top of the wide, stone-slabbed stairway was a landing with three doors: one to the left, one to the right and one in the centre. This one was ours. Opening it revealed a fairly large hallway, and, stretching right and left, a corridor with a long, pale-blue carpet on it. On turning left at the front door and proceeding down the passage, there were two rooms. The first on the right was the kitchen. It was quite large – large enough, in fact, to seat six people, and for that purpose there was a table and six chairs in the centre. To the sides were various cupboards, as well as a larder and a fridge. This again, was a new toy for us: never before had we owned a fridge. The walls were tiled, as was the floor. The room at the end of the passage was the living room. It was the largest room in the house and contained a three-piece suite, a dining table and its accompanying chairs, a cupboard and a sideboard. Like the kitchen, this room had two sets of windows. The dividing wall between the two rooms had a very handy serving hatch in it. Again, this was something that we had not come across before. Turning right down the passage from the hallway led to four rooms, the first of these being the bathroom, which also contained the toilet. Like the kitchen, it had tiled walls and floor. In here, above the bath and suspended from the ceiling, was a purpose-built drying rack, which consisted of about five or six racks, joined together at both ends, which was the same length and width as the bath into which the drying garments would drip. The whole contraption was raised and lowered from the ceiling, as you would raise and lower a lifeboat on a ship, with a simple pulley system. Very clever, and so useful, too. Next door to the bathroom was the washroom. As the name suggests, it was a purpose-built utility room. It was also the smallest room in the house. It contained a large sink unit, with draining boards on each side, one of which housed the mangle. Just inside the door was a huge (to this small boy it was anyway) hot-water tank and airing cupboard. Also kept here was a boiler, plus all of the pots and brushes, mops and so on necessary to clean a building. Barbara Rayner (née Messenger) has generously donated a number of her family photographs to TACA, including mementoes relating to her family’s posting to Tripoli, Libya (‘PICTURES: TROOPSHIP TIPS, BOAC TICKETS AND TRAVELLING TO AND FROM TRIPOLI, LIBYA, 1950S’); a class photo from her time at primary school in Sennelager, (West) Germany (‘PERSONAL STORY: ‘A COUPLE OF YEARS AFTER THE CLASS PHOTO WAS TAKEN, WE WERE ON A SIX-WEEK VOYAGE TO JAMAICA’’); souvenirs of her voyage, made in 1960, on the MS Dunera from Southampton to Jamaica (‘PICTURES: MEMENTOES OF A JOURNEY TO JAMAICA ABOARD THE MS DUNERA, 1960’); photographs of a guide to families posted to Jamaica dated 1959 and of her return visit in 1990 (PICTURES: ‘A GUIDE TO FAMILIES GOING TO THE CARIBBEAN’, 1959, AND REVISITING JAMAICA’S UP PARK CAMP IN 1990’); and a school photograph from her time in Jamaica (‘PICTURE: A SCHOOL PHOTOGRAPH, UP PARK CAMP, JAMAICA, EARLY 1960S’). 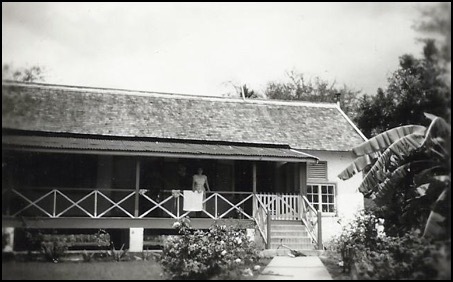 On that return trip, Barbara also located and photographed the married quarter that she and her family lived in: ‘I am attaching photos of our house in Jamaica taken in 1960 and 1990’, she wrote in an e-mail accompanying the two photographs reproduced below, continuing, ‘There’s not that much difference considering they are 30 years apart! 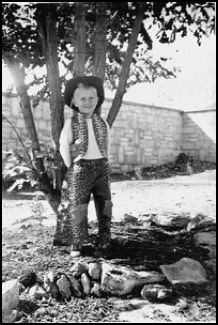 That’s my mum in the 1960 photo. Even the mango tree in our garden was there, albeit much bigger, but I remember eating delicious mangoes every day during the season’. TACA is once again indebted to Barbara for adding to our archive of images. 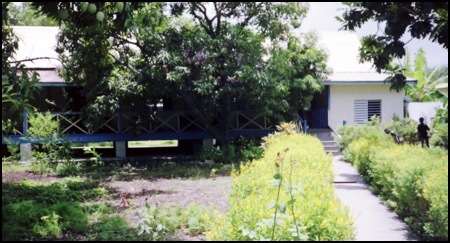 Above and below: The married quarter in Up Park Camp that was the Messenger family’s Jamaican home, pictured in 1960 and in 1990. If your family lived in one of these caravans while stationed in (West) Germany, we would be fascinated to learn more. 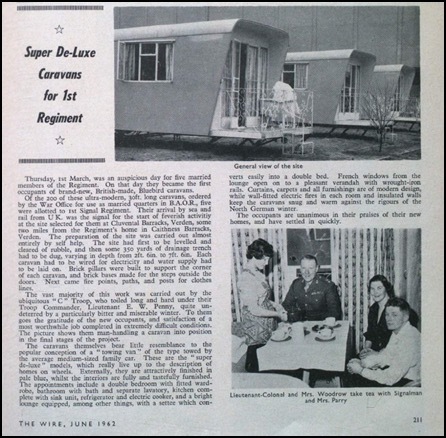 UPDATE: see below, ‘TACA CORRESPONDENCE: ‘SUPER DE-LUXE CARAVANS’ ESTABLISHED AS MARRIED QUARTERS IN VERDEN, (WEST) GERMANY, 1962’. Anca, a German researcher who is writing a history of the German town of Verden entitled ‘BAOR: The British Garrison of Verden (Germany), 1945–1993’ (see ‘NEW RESEARCH PROJECT: DOCUMENTING BRITISH ARMY CHILDREN’S EXPERIENCES OF VERDEN, GERMANY, 1945–93’), contacted TACA in response to the item that we posted about caravans being pressed into service as married quarters in (West) Germany in the early 1960s (‘PICTURE: ONE OF 200 CARAVANS BOUGHT BY THE ARMY TO SERVE AS MARRIED QUARTERS IN (WEST) GERMANY, 1961’, above). According to Anca, some of the caravans were set up in Verden, and she kindly directed us to a relevant article that was published in the Royal Signals’ magazine, The Wire, in June 1962 (see below). ‘Thursday, 1st March, was an auspicious day for five married members of the Regiment. On that day they became the first occupants of brand-new, British-made, Bluebird caravans. Of the 200 of these ultra-modern, 30ft. long caravans, ordered by the War Office for use as married quarters in B.A.O.R., five were allotted to 1st Signal Regiment. Their arrival by sea and rail from UK. was the signal for the start of feverish activity at the site selected for them at Cluvental Barracks, Verden, some two miles from the Regiment’s home in Caithness Barracks, Verden. The preparation of the site was carried out almost entirely by self help. The site had first to be levelled and cleared of rubble, and then some 350 yards of drainage trench had to be dug, varying in depth from 2ft. 6in. to 7ft. 6in. Each caravan had to be wired for electricity and water supply had to be laid on. Brick pillars were built to support the corner of each caravan, and brick bases made for the steps outside the doors. Next came fire points, paths, and posts for clothes lines. The vast majority of this work was carried out by the ubiquitous “C” Troop, who toiled long and hard under their Troop Commander, Lieutenant E. W. Penny, quite undeterred by a particularly bitter and miserable winter. To them goes the gratitude of the new occupants, and satisfaction of a most worthwhile job completed in extremely difficult conditions. 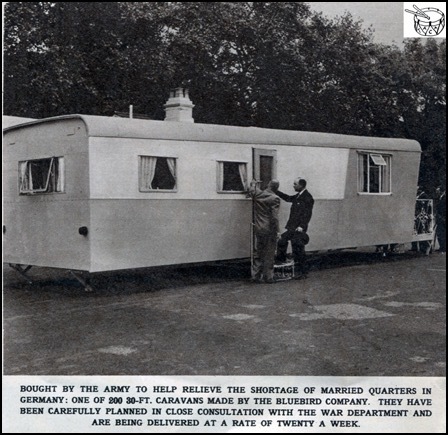 The picture shows them man-handling a caravan into position in the final stages of the project. The caravans themselves bear little resemblance to the popular conception of a “towing van” of the type towed by the average medium-sized family car. These are the “super-de-luxe” models, which really live up to the description of homes on wheels. Externally, they are attractively furnished in pale blue, whilst the interiors are fully and tastefully furnished. The appointments include a double bedroom with fitted wardrobe, bathroom with bath and separate lavatory, kitchen complete with sink unit, refrigerator and electric cooker, and a bright lounge equipped, among other things, with a settee which converts easily into a double bed. French windows from the lounge open on to a pleasant verandah with wrought-iron rails. Curtains, carpets and all furnishings are of modern design, while wall-fitted electric fires in each room and insulated walls keep the caravans snug and warm against the rigours of the North German winter. We are most grateful to Anca for drawing our attention to this detailed article. For more of Peter’s photographs, see: ‘PICTURE: A CHRISTMAS PARTY FOR ARMY CHILDREN AT THE CAMBRIDGE MILITARY HOSPITAL, ALDERSHOT, IN 1967’ and ‘PICTURES: SNAPSHOTS OF DHEKELIA, CYPRUS, 1968–72’. John Andrews’ father was serving in the Royal Signals when John and his family lived in Bushey, Hertfordshire. As John explains, following a recent visit, he is keen to hear from anyone who lived on the same patch, or has any information to share about it. ‘I recently visited the old army patch in Bushey, where my family lived twice: between 1967 and 1971, and again, after a posting at Bovington Camp, between 1974 and 1976. (My dad, Lt-Col Ted Andrews, retired in 1976.) We lived in Harcourt Road and Turner Road. I visited the patch again last weekend as I was nearby, and was saddened to see that half of the housing has been knocked down and that the rest appears to have been sold off. I wondered if anyone has any old photos of the patch and details of when it was built. I loved living there – we had a great gang as kids and played football day and night. I went to the primary school down the road: Little Reddings, opposite Bishop’s Supermarket. If anyone has any information or recollections, please get in touch via my e-mail address. John’s e-mail address is johneandrews@btinternet.com.